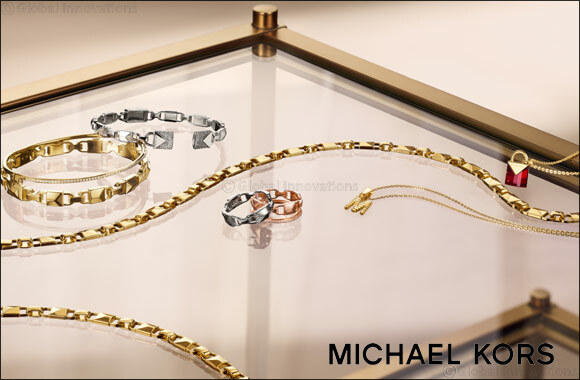 Dubai, UAE, August 02, 2018: Michael Kors is pleased to announce the launch of a new jewelry collection made from sterling silver, semi-precious stones, sparkling accents and luxe plating in 14-karat gold, rose gold and rhodium. Rich in detail and designed with a timeless sensibility, the collection offers seasonless, feminine necklaces, bracelets, rings and earrings that can be worn separately or stacked together for versatile everyday wear. The new line takes as its starting point the Mercer Lock, an iconic brand element inspired by Mercer Street in New York City’s renowned SoHo neighborhood, where Michael Kors opened his first downtown store. For the launch, there are three distinct but related stories, all centered around the lock motif. First is Mercer Link, in which the signature padlock charm has been reimagined as an elegant chain link. Kors Color is a brilliant array of customizable gemstone pieces designed to help celebrate life’s special moments as well as your own personal style. Finally there’s Custom Kors, a group of collectible charms and nesting bracelets and rings with interchangeable elements that allow you to personalize your everyday pieces. The Mercer lock, with its custom faceting that forms the shape of an ‘M’, has long been identified with the Michael Kors brand. “I’ve been sketching different takes on the letter M since I was a kid. There’s something architectural about the shape of the letter that translates into a strong, glamorous graphic element,” said Michael Kors. Now, with Mercer Link, the lock has informed the design of a unique and sophisticated chain, transforming traditional chain-link necklaces, bracelets and rings into feminine pieces perfect for everyday wear. This collection of stylish bracelets and necklaces features semi-precious gemstones for looks that are rich with vibrant color. Pick your birthstone or color that represents your personal style. Jewelry is deeply personal, and the playful charms and interchangeable features of Custom Kors are designed to allow for true customization. Collectible charms let you share your story, while versatile nesting bracelets and rings are perfect for stacking or wearing as a stand-alone statement. The Michael Kors Fall 2018 Jewelry Collection will be available at select retailers worldwide beginning August 2018.